AFS Analytics provides a great feature which helps users to monitor keyword positioning in Google, Bing, and Yahoo search engines. One of the biggest mistakes made by bloggers, article writers, or SEO experts is to publish content on a website without targeting keywords. One crucial element of a webmaster’s job is to get their website’s pages as high as possible in the search engines’ ranking. To reach this goal, they need to adapt the content of their site to the targeted keywords. Once the website’s content is optimized for S.E.O (Search engine Optimization), you will have to check and monitor the search engine ranking of each page for each targeted keyword. AFS Analytics offers a tool that automatically performs this task. Each day, the position of your website, according to the keyword you defined, is checked on the search engines results page (SERP). To know, how you site ranks, AFS Analytics checks the 200 first results for Google, Bing or Yahoo Search Engines. 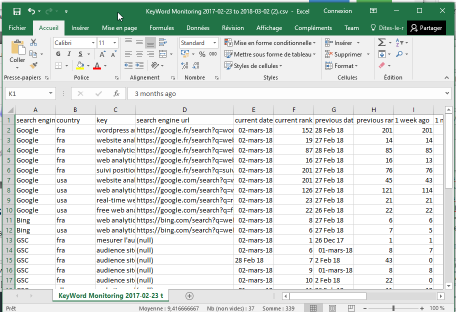 If you linked your "Google search console" account to AFS Analytics, you will able to check the data provided about your keywords rank by selecting the option “GSC” as source. Once the selected option is submitted, a page appears with a list of words to monitor. It is empty if no keyword has been previously added. 1. Click the “Monitor a new keyword” button. 2. A box opens showing suggested keywords. Click on one of the keywords to add it to the list. If you wish to add an unlisted keyword on the list, click the “Monitor an unlisted keyword” button. 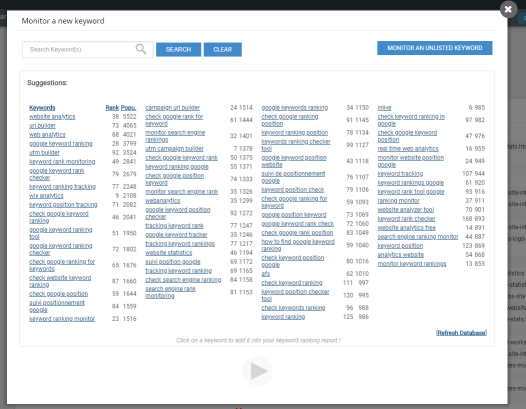 Note: The suggested keywords list is only displayed when your "Google Search Account" has been linked to AFS Analytics. The average ranking and the popularity of each keyword is displayed. The popularity shows the visibility (volume of impressions) of your website in Google’s results. 3. A new box appears asking you the detail. You need to select the search engine source: (Google, Bing, Yahoo or GSC) and the keyword. The rankings being different for each country and language, you need to choose the targeted country and language. By selecting the “ALL “ option, an average ranking will be calculated if you selected GSC as source. Once the selection is finished, click the “Submit” button. The keyword will be instantly added to the monitoring list and the rank will be updated in a coupe of hours. The list is updated daily. However, If a keyword is unpopular or low ranked, you may have to wait longer. Source: Search engine source: Google, Bing, Yahoo or GSC. Click on it to see page results. Keyword: The keyword your defined. Country: Targeted country for search engine. Current: The keyword current rank. Prev. : The keyword previous rank. 1 We. : The rank one week ago. 1 Mo. : The rank one month ago. 3 Mo. : The rank 3 months ago. 6 Mo. : The rank 6 months ago. 1 Ye. : The rank 1 year ago. Page:The website page linked to the keyword. A trashcan icon to delete the keyword. For Google search console (GSC) results, when a keyword is linked to several pages, a new line will be displayed for each page. The capture date is displayed when you mouse over the ranking. By clicking on the ranking, the keyword’s position’s history will appear. You can filter and customize your search results by keyword, source or country. You can export the data in CSV, SCSV (Semi-colon separated value) with the outpout field. This feature is available with Silver and Gold plans. This article was written by AFS Analytics , 3 March 2018. Please contact-us for spelling correction, updates or additions.